This photograph of Currency Office in Dalhousie Square from the 'Walter Hawkins Nightingale (PWD) collection: Album of views of Calcutta, was taken by an unknown photographer in the late 1870s. 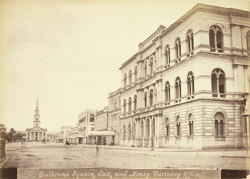 The Currency Office, on the east side of Dalhousie Square, contained the Office of Issue and Exchange of Government Paper Currency. Dalhousie Square, named after Lord Dalhousie who was appointed Governor-General in 1847, was the main administrative area of Calcutta. The square also housed the headquarters of the East India Company known as the Writer's Building, the Currency Office, and the General Post Office. Dalhousie Square has been renamed BBD Bagh after three Indian nationalists Benoy, Badal, and Dinesh. St. Andrew's Church is visible in the background.